What is observed here has been little or not at all observed by K. Birkeland. The ease of modern equipment to change configurations is one reason: it took at least three weeks to Birkeland to proceed to a change that takes less than half an hour today ! But the flexibility of the Planeterrella mounting is the major reason. In this configuration, the large sphere is a planet, which receives its stellar wind either from the electric nozzle or from the smaller sphere (which in this case is surrounded by a ring current here). 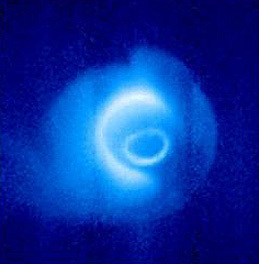 We see very well a plasma enveloppe surrounding the planet and ending in the atmosphere over the auroral oval. This is the creation of the Van Allen radiation belts. Electrons are attracted toward the large sphere by the electric field. This field simply exists because the sphere is connected to the positive pole the generator. 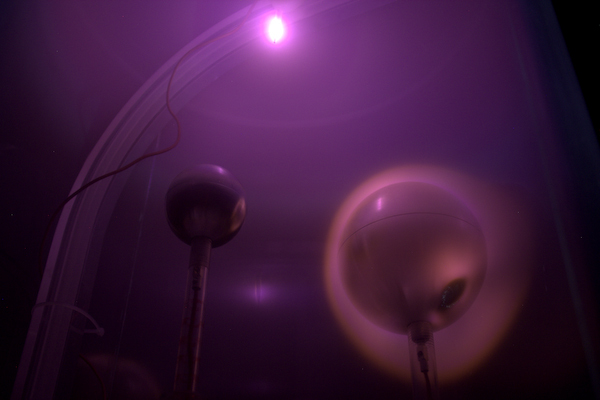 Arriving near the sphere, the electrons start to undergo the influence of the magnetic field. The more they come on, the more the field grows. The effect of this growing field is to force the electrons to turn around the sphere (for physicists : this is a gradient drift). There they hit the gas still present, the highly rarefied air. These collisions excite and ionize the gas mixture of nitrogen and oxygen. Returning to the equilibrium, the air releases its energy as light: this is the creation of polar auroras so well visible with the Planeterrella. But sooner or later, the electrons undergo a collision that will divert them to the poles. The light is more intense on the auroral oval, because the concentration of electrons is higher. We see the Van Allen Belt differently than in case one. This is due to the fact that the configuration of the magnets is different. Indeed, in the center of the small sphere, there is a dipole magnet of intensity 800 mT. The north magnetic pole is located in the "north" of the sphere and the south pole magnetic "south", meaning that their axis is vertical. In the large sphere, there are two magnets, each with an intensity of 400 mT, but they are inside against the interior of the sphere. Their axis is tilted about 20 ° with respect to the vertical. The area of space where lies the radiation belt is a part of the magnetosphere called the plasmasphere. The magnetosphere is that part of the space in which the influence of the magnetic field of a planet is more important than that of the solar wind. It is a very complex volume, where many electric currents are formed. The photographs of the magnetosphere are exceedingly difficult to make. But the NASA spacecraft IMAGE does provide splendid views quite similar to what shows the Planeterrella.